The prospect of evening thunderstorms (with a dog who is upset by them) turned today from a dinner-out-evening to a brunch-somewhere-afternoon. A conversation with a neighbor while walking said dog, followed by a quick search on Chowhound.com put Lineage in Brookline at the top of our brunch list. We've been there for dinner and lunch but never for brunch and Michael's Deli is only a couple of doors away. So supper was also planned in one swoop. 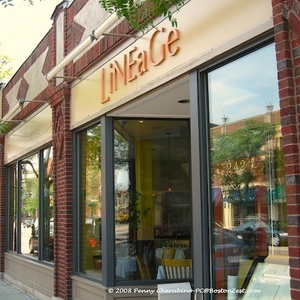 The Lineage Brunch menu is well balanced between breakfast and lunch foods. They offer breakfast breads, eggs, crepes, salads, whole grain French toast, a burger, local halibut "fish & chips," crab cakes, and fruit plates. Today we both leaned towards the lunch menu. 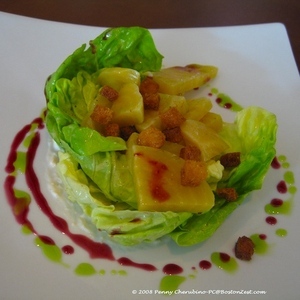 We shared a Roasted beet salad with bibb lettuce, horseradish and brioche croutons. 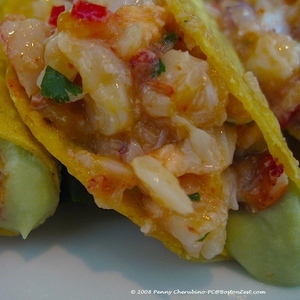 I followed with an appetizer portion of lobster tacos with avocado mousse and mango salsa and Ed had the grilled salmon with a sweet 100 tomato and cous cous salad. Finally, we shared a butterscotch pudding. Service was outstanding from the moment we walked through the door until we headed out and our waitress Renee tried to drop what she was doing to open the door for our exit. I've loved Lineage from the start and with today's meal; Ed is really warming to it. 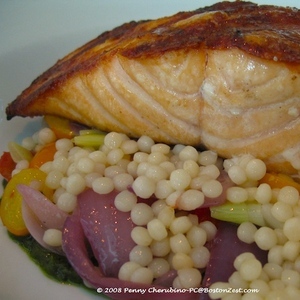 He said he hasn't had a better plate of salmon and complemented the espresso. Oh, and he is interested in a return trip some evening between 5 and 7 PM to try the Island Creek Oysters for $1.